We are about to take off with the coolest airplane birthday party ideas, so please stow your luggage, buckle your seat belts and sit back for a really cool ride! You’ll find many of the coolest ideas for an airplane birthday party right here on this page, so get your scrolling finger ready and start flying down this page! Finding the perfect location for the party is one of the first things you’ll be needing to do. If you are thinking of having the party indoors, you’ll want to first check and see that the designated airplane birthday party area will be clear of breakable objects and make sure it’s safe. If you have a backyard or park nearby, these are also great options. Remember, since this is an airplane birthday party, you might have paper airplanes flying everywhere, so an outdoor setting may suite more. Another cool idea to consider is to hold your airplane birthday party at a nearby local airport. I’ve checked many airport websites, and none that I have seen write about holding parties, BUT this doesn’t mean they wouldn’t allow it. There are people who have called their local airport and got permission to hold such a party (in one of the conference rooms or any other room in the airport that could be suitable for a party). For this, you will need some time and patience to call the airport (or arrive there), and talk to a higher executive. You might also need to be a bit more steadfast then usual, but there are a few I know who have made it happen, paying a reasonable price, and have celebrated their parties at the airport (it’s probably easier to check out a smaller and local airport than an international one). In any case, this can be a really cool idea, as it may be extremely exciting for the young ones (many of whom may have never been at an airport or seen a real life plane). Make sure to ask if you can bring your own decorations, food, etc. Another option is to find out if there is an airplane museum or airplane hangar in your area, a place where airplanes are parked, worked on, etc. This could be a great place to take the kids to check out (it’s best if you arrive first to the hangar and get permission to bring kids there). This can be educational too, possibly someone can guide you around to see all kinds of airplanes and talk about how airplanes fly and other fun interesting facts. A really cool idea is creating invitations that look like airline tickets. To make it easier for you, we’ve made printable airplane party invitations that look like real airplane tickets. You just need to fill in the needed airplane birthday party information: Birthday Child’s name (for example “You are invited to: Susan’s Airplane Party”), Date and Time of the Party, Number for RSVP, Passenger Name, Address of Party, etc. To the right of the airline tickets, there are a few lines you can fill in if you have more information you need and want to add. Plus, you can also use your last name or child’s first name for the airline name (example: Miles Airlines, Air Susan, Walker Airways, etc.) and write it to the right of “FIRST CLASS” using your computer or by hand. The right side of the airplane birthday party invitation is the part that is perforated on real airline tickets. You can perforate them yourself with a simple perforating tool (it looks like a pen with a wheel on the end. On the wheel there are needles, that when you roll it on the paper, it perforates it. It’s not an expensive tool, and costs between $5-$20). This way, when the passenger (invited guest) comes to the party, they can bring their tickets and to get them through checkout, you detach the right part of the ticket (the way they do when you’re just about to go on the plane) and leave them the stub. These airplane tickets fit into long rectangular envelopes. We recommend you print them out on stock paper or heavier paper than the usual. Plus, you can try different colored paper – try gray, blue, orange, pink, etc. (anything that fits the theme colors you choose). The only real work you will need to do is cut out each invitation – around the border (HEY! Why not let your kids do it ;-D). On the back of the airplane birthday party invitation you can write, “This ticket is non-transferable” and all kinds of other cute remarks like “Just Plane fun!”, “Passengers are allowed one or two carry-on parents”, “2 parents per passenger”, “If additional seats are needed or if you’re unable to make the flight, please call our Airlines ticket agent”, etc. You can also add a Computer Code that looks like an airline ticket code, along the bottom of the ticket “12082002; FIVEYE ARSO LD; 2009″. This is your child’s birth-date (in our example 12/08/2002), the age of your child (in our example “five years old”), and the year of the birthday (in our example – 2009). 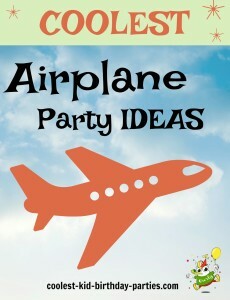 Check out these cool free printable airplane invitations. Once you print them out, you can put right in the plane’s window a picture of your birthday girl or boy’s face (they of course are the pilots!). You can also write your invitation on paper and then fold the paper into a paper airplane. If you’ve forgotten how to fold paper airplanes, check out this really cool paper airplane folding website that shows tons of different ways and different paper airplanes you can fold yourself. You can also buy inexpensive air gliders or wooden airplanes and write all your party information on them. Or, you can buy ready-made airplane and jet invitations that come in a special party pack. Another cool idea is to use cute inflatable airplanes you can buy (made from the same material that pool inflatables are made from – you can find inflatable airplanes on eBay!). Blow up the plane, then write all the party information with a permanent marker, let the marker dry, let all the air out, fold the inflatable airplane, put in an envelope, and VOILA! An inflatable airplane invitation! You can also look for airplane balloons and write on them (remember to write all of the party information when the balloon is blown-up, let the marker dry, and then take all the air out). A nice decoration is to hang paper airplanes you and your kids fold, as well as little toy planes and inflatable planes. Use strong fishing wire or thread to hang them. If you have a ceiling fan, you can tie a few planes onto the wings of the fan, turn on the fan to a slower spin, and as it spins the airplanes fly in a circle. You can also hang bunches of cotton balls from the ceilings, and even bunch up many white balloons to seem like clouds (each bunch would symbolize one cloud). We’ve also created large and medium clouds for you to print out and hang from the ceiling, that way you have airplanes flying in between clouds. There aren’t specific colors that suite this airplane birthday party theme, it really matters what color combination best fits your taste. If you are going for more of an Airplane and Airlines look, try choosing two or three colors that remind you of the inside of an airplane (for example: American Airlines and Delta – red, white, blue, and grey. Or Japan Airlines – red, white, and black). It really all depends where you come from and what colors most spark your association with airplanes and airlines. You can print these airplanes on colorful paper or print on white paper and let your kids color them in. Then tape them onto walls or objects in your party area. You can also print them on heavier paper, cut them out, and hang them from the ceiling, from trees, from posts, etc. in all kinds of heights. Whichever color scheme you may choose for your airplane birthday party, it’s always great to hang balloons and streamers around the party area in your color scheme. If you choose two or three colors for your color scheme you can take two or three streamers in these colors, put them back-to-back, and twist them to create a cool effect. The same goes for balloons, bunch them up with all of the colors inside the bunch, or decide if you want each bunch of balloons to be just one of the colors (that way you might have many bunches of balloons all around, but each bunch will all be one color). As for the airplane birthday party table, you can also make it look like a runway. Cover it with butcher paper and lay two strands of white Christmas lights down the center of the table. In the center of the runway, you can lay a few toy airplanes or jets. Another cool idea is to take a huge map and use it as a table cover (Triple AAA has free maps you can use). Make a few airplane signs to place in your front yard or to decorate the party area. They could say: “Child’s name” Airport, “Baggage Claim” (which can be the place your guests will put the birthday presents or where you will put their party bags and favors in a huge opened suitcase), “Gate 4” (for gate number you can use the age of your child), “Terminal 8”, “(child’s name or last name) Airlines”, “Welcome on Board”, “The Sky is the Limit”, etc. If you have a driveway, you can turn it into a runway by unrolling a strip of paper down the center and draw lines and arrows on it (it’s even better to do this with chalk to save on paper!). If you have inflatable or large toy planes, put them on the runway as well. If you want to go more with a Jet and F-16 look, the colors would most likely be grey, black, blue, and silver. And if you’re child likes army planes, then you might want to consider camouflage colors, such as: green, black, khaki, browns, and yellows. It’s really cool to put signs around the party area. An idea is to put the word “ARRIVAL” in the entrance and “DEPARTURE” on the door way out. They can be big and drawn on big paper with markers (your kids can color them in). You can decorate your airplane birthday party area with cool aviation posters attached to the wall and maps of the world. You can draw on the maps, an airplane with a marker and the route it has flown. Your whole family can dress up as the crew of an airline. Put colorful handkerchiefs around your necks and possibly all wear white shirts, which you can print an airplane on, or some kind of Airline logo. If your child has a Pilot suit, they can wear it throughout the party. You can also print out these printable airplane birthday party hat. All you have to do with the printable hat is print it out, cut around the half circle, roll it up and staple! Take a look at all the coolest homemade Airplane costumes. First off, when the kids start arriving to the airplane birthday party, you can put outside your door (before they walk in) or right when they walk in, a check-in desk. One of the adults or children can look like an airlines stewardess and the arriving passenger will be taken in through check-in. You can make tags with rubber bands to put on the passengers luggage (bag or back-pack), where they put their name, address and telephone (you can buy luggage tags at Office Depot or stop by at a local airport to take or buy a few). Take all kinds of colored and shaped stickers and put them on the passenger’s baggage just like they do when you go through check-in. The first stop after check-in could be a table where the kids create their own passports. Look at your own passports to get an idea of the size. If you have a Polaroid camera or a laptop computer that has a small camera, you can take their photograph and glue it to their passport (you can also do this with a digital camera if you have a computer and printer close by). Have the kids fill in their information: Name, Date of Birth, Female/Male, Date of Issue, etc. If the twist of this theme is more geared to military airplanes and jets, you can refer to each arriving kid as a PILOT. For this you can create badges or stickers with their names on them and stick on or pin on their chests. Also, you can take rectangular thin stickers and put on the top of their shoulders as if they have a high rank. You can also put these stickers on their chest above or below their name badge for more ranks. If you choose this military jet theme twist, the kids can create their own “Pilot ID’s”. For this you will need small pieces of card stock (you can create these the size of Driver License’s, which fit in a wallet). You can either photograph each child with a Polaroid or digital camera (or ask each child to bring a passport picture). If your child has a pilot suit, you can let each child wear it in turns and photograph them in the pilot suit. An even easier idea is to let them wear a pilot’s hat and just photograph their face wearing the hat. Glue the picture on the card and let the kids fill in the needed information: Name, Date-of-Birth, Female/Male, etc. On the top of the card write a title like “PILOT ID”, “CAPTAIN”, etc. To finish, laminate them – you can buy a laminator at most craft stores. You can also laminate by taking clear tape (the kind you use for packaging) – put a piece on the front of the card, then put another piece on the back of the card, and cut off the excess tape from all sides. With the ID’s you can give each kid a metal dog tag (just like they give pilots or soldiers). Kids love folding paper into airplanes and flying them. So do adults! You can assign a table with color pencils, crayons, markers, etc. where kids can color paper and fold them into paper airplanes. You might want an adult who knows how to fold a few different kinds of paper airplanes who can help the kids out. You can also call this an “Airplane Mission” and have one of the adults be a “Captain” who gives a small speech about how important this airplane mission is, and have the Captain explain the “mission” and procedure for creating the airplanes (even have a blackboard so that the Captain can sketch on… If the Captain is serious about it being a “mission” to create the planes, the kids might take it just as serious as if it were a real mission). Here is a cool airplane paper folding website that shows many different ways to fold paper airplanes. Later on, the kids can take their planes outside and hold an airplane contest. Take a look at all the coolest homemade Airplane birthday cakes. If you end up creating an airplane or jet as the cake, a cool idea is to take a large map of the world (or of a specific country or part of the world) and cover your table with it (or cover a cake-board). Then take your airplane or jet cake and place upon the map as if it is flying over the world. A simple idea for an airplane birthday party cake is to create an airplane runway. This is a very simple cake. First you bake a sheet cake and frost it with a gray color as the runway (you can also make a long runway by putting two cakes together – the long way). Use yellow and white candies for the lines on the runway. Then place toy airplanes and jets on the cake. Flight-Pack: You can make each passenger his or her own flight pack. This can be on little trays, in little boxes or inside little bags. Each can be decorated with airplane stickers or stickers you draw or print on with an Airline logo. Pilot’s Sandwiches: Inside the flight-pack you can take regular sandwiches and wrap them in plastic wrap. Then put stickers on the wrapped sandwich that have to do with the Airline you’ve created – for example “Susan Airlines” or “Henry Air” plus add “Flight 747 – Crew” or “Passenger”, whichever you choose. You can also take an airplane cookie cutter and cut the bread for your sandwiches in airplane shapes – that way the sandwiches will fly right into peoples’ mouths! You can also make mini pizzas cut out in airplane shapes. You can even do this as a buffet where the kids design their own airplane and jet mini pizzas, putting all the toppings they like (olives, mushrooms, tomatoes, etc. ), or just create these yourself with a variety of different toppings or just plain cheese. Jet Fuel: this can be power drinks (like Gatorade) or punch. You can also try making shakes with different fruits. For shakes you will need a blender and before you put in the fruits (or frozen fruits), choose if you want the shakes to be juice based, yogurt based, milk based or water based (my favorite is bananas with dates on a milk base :-). On each cup you can put a sticker that says “Jet Fuel” on it. You can also serve various juices and sodas on a drink tray – the same way they do during flights. Put airplane stickers on different juice boxes. Peanuts: Serve packets of roasted peanuts just like they do as a treat on the plane. Airplane treats: There are airplane-shaped fruit snacks you can find at your local supermarket. We have created these printable and foldable favor bags and favor boxes for you airplane birthday party. They are blank and so the kids can decorate and fold them themselves. You can also create them before the airplane birthday party. For the favorbox and medium airplane favorbag – print out, color if needed (or print on colored paper) and cut out. Before you start gluing the favorbox and favorbag, fold along the dotted lines and assemble so that all the sides connect. Only then add glue and secure the folded flaps. To create the large airplane favorbag you’ll need to print out TWO designs. First, cut along the lines and fold along the dotted lines. Then, connect the two so that the left side of one is glued to the right side of the other. Favors you can put inside: toy planes, airplane snacks and crackers, airplane stickers and tattoos, whistles, airplane gliders, binoculars, pilot hats, airplane pins or badges, airplane magnets, airplane magnifying glass, airplane pens, flashlights, maps, playing cards, airplane key-chains, compass watch, etc. 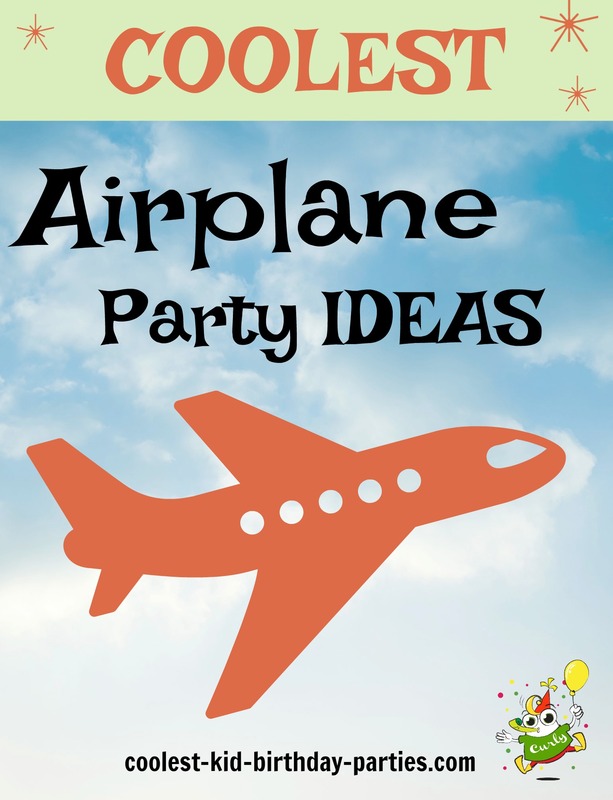 There are lots of great game ideas that fit perfectly with this airplane birthday party.